Stock prices plunged again on Thursday as a series of big December plunges has stocks on track for their worst month in a decade. Stock prices plunged again on Thursday as a series of big drops in December kept stocks on track for their worst month in a decade. 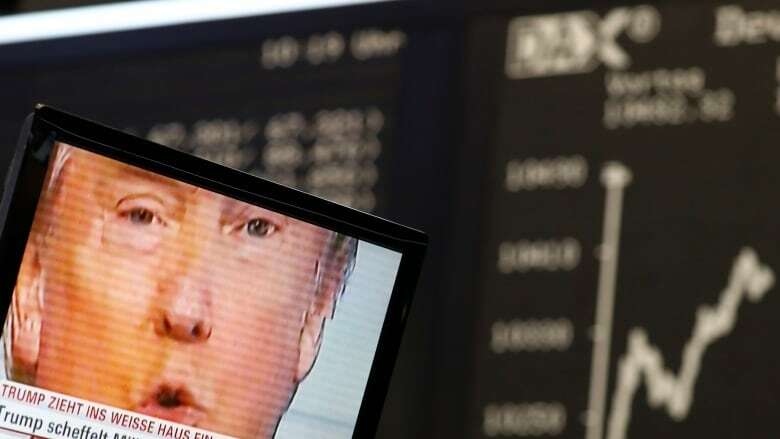 The Dow Jones Industrial Average dropped 464 points, or just under two per cent, bringing its losses since Friday to more than 1,600 points. The benchmark S&P 500 index has slumped 10 per cent this month and is almost 16 per cent below the peak it reached in late September. The technology-heavy Nasdaq composite is down almost 20 per cent from its record high in August, placing the index into official bear market territory. After steady gains through the spring and summer, stocks have nosedived in the fall as investors worry that global economic growth is cooling off and that the U.S. could slip into a recession in the next few years. The S&P 500 is on track for its first annual loss in a decade. If it finishes the year at its current level, the Dow Jones will also post its worst year since 2008. The Toronto Stock Exchange lost almost one per cent to close at 14,138. 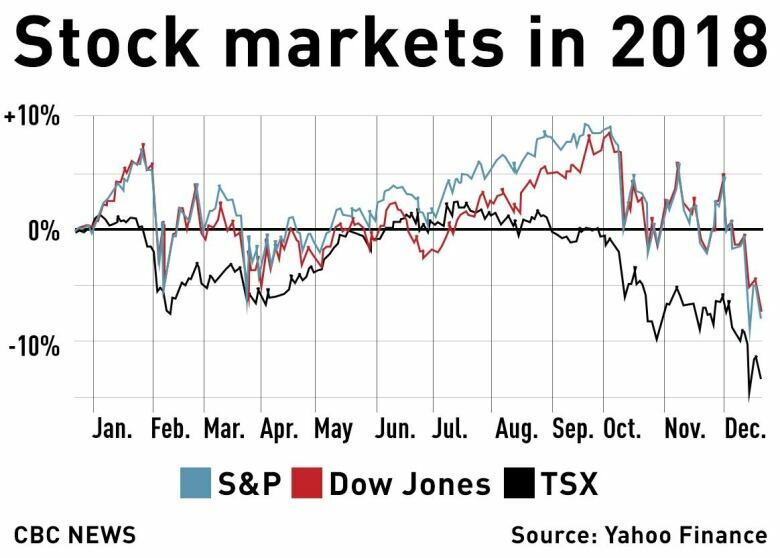 Canada's benchmark index has lost about 15 per cent of its value since July. Oil is a big factor in the TSX's woes as the price of West Texas Intermediate continues to languish, down $2 a barrel on Thursday to $46.15. The weakness in oil briefly pushed the Canadian dollar below the 74 cent mark on Thursday, a level the loonie hasn't breached since early 2017. Right now, markets are concerned about the potential for a slowing economy and two threats that could make the situation worse: the ongoing trade dispute between the U.S. and China, which has lasted most of this year and shows few signs of easing, and rising interest rates, which act as a brake on economic growth by making it more expensive for businesses and individuals to borrow money. Scott Wren, senior global equity strategist at Wells Fargo Investment Institute, said that Fed Chairman Jerome Powell didn't appear concerned about the state of the U.S. economy, despite deepening worries among investors that growth could slow even more in 2019 and 2020. Wren said investors want to know that the Fed is keeping a close eye on the situation. Long term bond yields have dipped below short-term ones, something call it an "inverted yield curve" which is often taken as a sign a recession is coming, although it's not a perfect signal and when recessions do follow inversions in the yield curve, it can take a year or more.